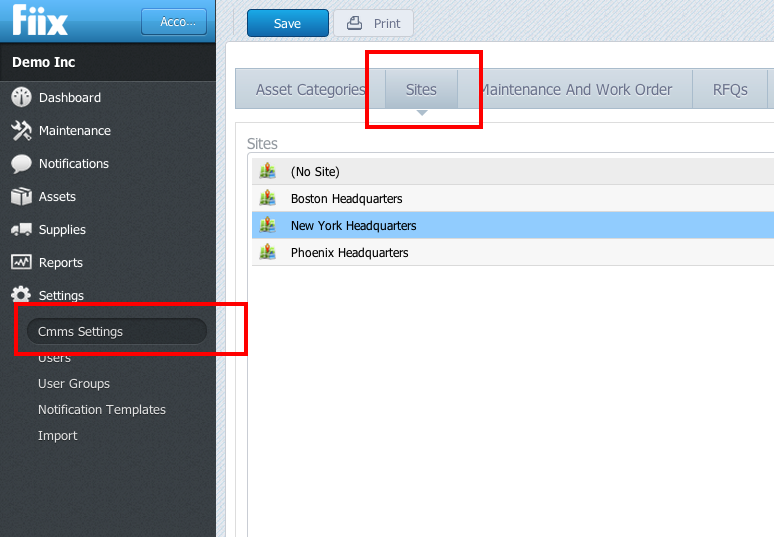 New feature – What is a multi-site CMMS? In our latest V5 release, we introduced multi-site functionality which makes collaboration across multiple locations easier than ever. Previously, all users in the system could see all maintenance related data such as preventive maintenance and work orders. With multi-site installed in your CMMS, you can operate multiple businesses, divisions, locations or facilities from one central CMMS database. This means your CMMS can be partitioned so different users throughout the organization have different access rights based on their location. Whereas user group permissions determines access rights to functionality such as reports or settings, sites determines access rights to asset and maintenance data in the CMMS. For example, user A can see maintenance data for site A, user C can see maintenance data for site C but Manager 1 can see data for both site B and C. The multi-site administrator can see all data from all sites. What does multi-site mean for your organization? Larger enterprises can now use Fiix across the globe, while allowing for local site segmentation of data. Your organization can standardize maintenance procedures and culture throughout the organization within one central CMMS. You can compare performance of equipment at different sites using advanced reports. Your organization can add additional sites to your CMMS without clouding existing data. 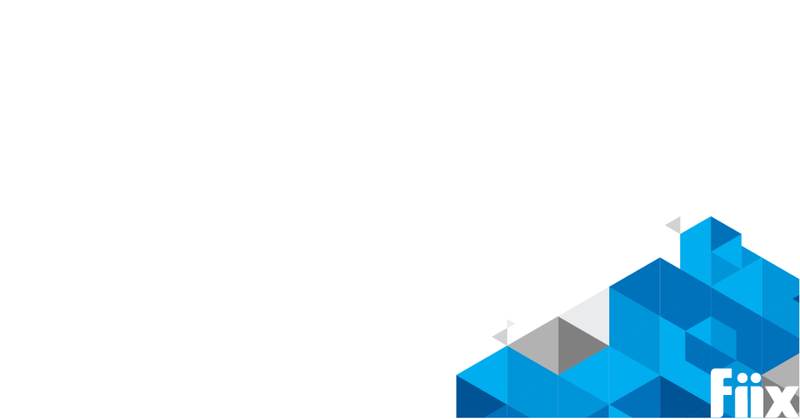 Sites adds an additional level of security to protect data across sites. You get kudos from top management for suggesting expanding your CMMS to other sites! 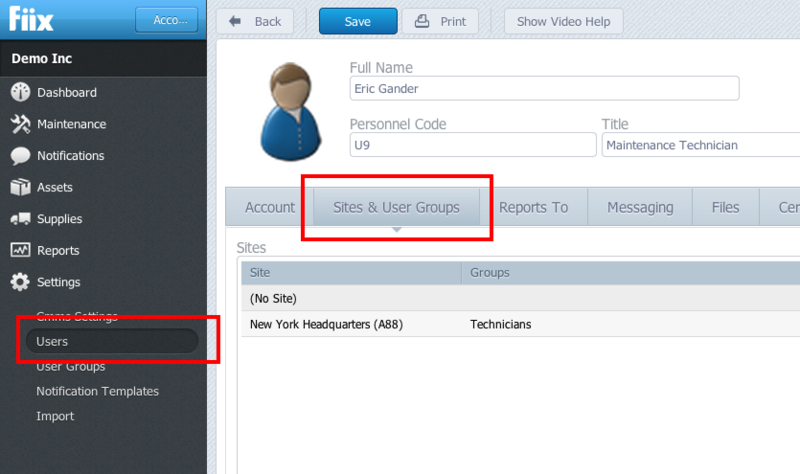 With multi-site enabled, you simply convert your top-level locations in your CMMS into sites in the settings section. All the assets in the location remain under it in the hierarchy but all the work order and preventive maintenance information related to the assets in the site, follows the site. In the user record, you assign the user to a site so when they log in, they will only see maintenance and asset data for that site. When you grant access to multiple sites, a toggle dropdown appears on the top right of the user’s account allowing them to switch between various sites. For more information on how sites works, and how you set it up, check out our multi-site implementation video. The gatekeeper – It is necessary to assign an administrator to the system so they can edit and update settings and customizations that are global such as maintenance types or asset custom fields. The system administrator also controls all the set up and configuration changes relating to multi-site, including adding, deleting or modifying sites. Common parts database – When searching for parts, your technicians can see inventory quantities at all sites. That way, if their location does not hold the part, they can choose to ship it in from another location or just order a new part from the supplier. On the other hand, parts consumed in a work order can only be pulled from inventoried parts at that site. If you use a part from another site, the part is moved physically by road or air, so you must also move it in the CMMS before it can be consumed in the work order. Asset naming – What happens if you have Mill 1 at site A but another Mill 1 at site B? When running reports across all sites, it will be difficult to determine which asset you are looking at. Therefore, it may be prudent to implement an effective asset naming convention so each asset in the system is easily identifiable. We’ve designed multi-site to be quick and easy to implement but the multi-site module must be enabled to access and configure multisite functionality. Contact support@fiixsoftware.com to get multi-site enabled on your CMMS.